Hydrogen is the smallest element. It exists not only in its natural Hydrogen molecule (H2); but also in numerous organic compounds, acids, bases, and even water. Although not considered a corrosive, at the right temperature/concentration, hydrogen can still cause problems with pressure transmitter through permeation. Hydrogen permeation is the diffusion of hydrogen ions through the thin metal isolation diaphragms used in pressure transmitters either through interstitial or substitutional (vacancy) mechanisms. Interstitial mechanisms: All metals have a natural lattice structure. Under specific conditions, any H2 in the process can break down into 2 H+ ions. The H+ ion is small enough to move between the spaces in the lattice structure without displacing any of the metallic lattice structure. 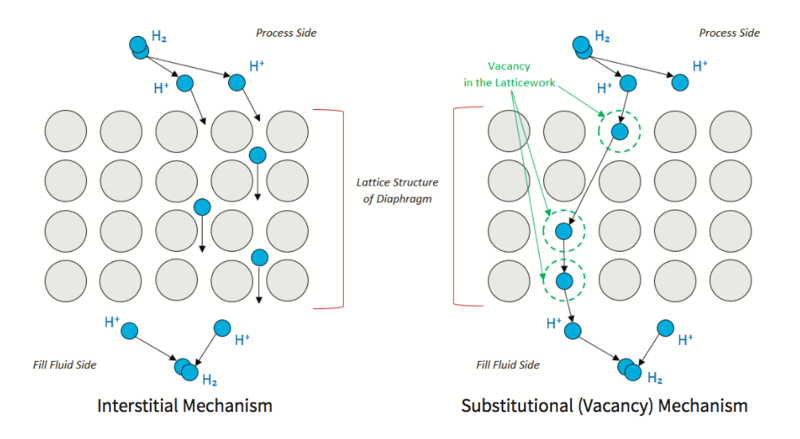 Substitutional (vacancy) mechanisms: Sometimes, in the latticework, there may be a void or vacancy where there should be material, but it is not there. The hydrogen ion can diffuse into this vacancy. With both these methods, the outcome is the same, Hydrogen breaks down in the process medium into hydrogen ions, diffuses through the diaphragm, and reforms into hydrogen molecules in the fill fluid. Over time the fill fluid becomes saturated, and hydrogen bubbles form. If enough of these bubbles form, the zero and span shifts, causing the transmitter to drift. In extreme cases, the hydrogen bubble can build up enough volume to force the isolation diaphragm to expand outward causing cracking of the diaphragm. Known as “Jiffy-Pop” because of the diaphragm’s appearance, these cracks lead to leakage of the fill fiuid into the process and the complete failure of the pressure transmitter. Eliminating hydrogen permeation cannot be achieved; but, the rate of diffusion can be reduced, thus extending the life of the transmitter. The rate of hydrogen permeation depends on the temperature of the diaphragm, the concentration of hydrogen in the process, and the type of metal chosen for the diaphragm. Two of these factors are controllable. Acceleration of hydrogen permeation occurs when the temperature of the isolation diaphragm is high. Reducing the temperature slows the diffusion of the hydrogen ions thus extending the life of the diaphragm. It is difficult to define what temperature is value ‘high.’ As a general rule, the higher the concentration of hydrogen, the lower the temperature needs to be. Two materials commonly used for diaphragms are Hastelloy C-276 (54Ni-16Mo-16Cr) (Yokogawa’s standard diaphragm material) and Monel (67Ni-33Cu) (diaphragm material option). Both are Nickel-based and provide excellent resistance to corrosives and have excellent physical and mechanical properties for being used as a thin diaphragm. Hastelloy C-276 adds chromium and molybdenum to nickel to help improve resistance to oxidizing, but, also retains some resistance in non-oxidizing conditions; making the material suitable for general use. Unfortunately, Hastelloy C-276 is susceptible to hydrogen permeation due to its loose latticework. Introducing a material of tighter latticework on the surface of the Hastelloy yields a diaphragm with all the benefits of the Hastelloy and better resistance to hydrogen permeation. The key is for the introduced material to not interfere with the spring rate of the diaphragm. Chromium (II) oxide (CrO) and gold (Au) are two such materials; both offer a different degree of protection against hydrogen permeation. The Chromium (II) oxide (CrO) is applied via the process of passivation. Passivation involves the creation of a light coating of CrO on the surface of the diaphragm to add a protective coating with a tighter latticework without interfering with the spring rate of the base material. The resulting latticework gives the Hastelloy the same resistance to hydrogen permeation found in Stainless Steel. All Yokogawa transmitters with Hastelloy C-276 diaphragm material have the passivated coating standard. Gold (Au) uses a plating process. Plating a thin layer of gold onto the surface of the diaphragm introduces a tighter latticework than the CrO. Increasing the thickness of the gold plating can account for applications having more free hydrogen ions. However, the thicker the gold, the more it affects the spring rate of the diaphragm. Yokogawa offers two options for gold plating. Option code / A1 plates to a thickness of 3μm and option code / A2 to a thickness of 10μm. Both options are not available on every transmitter, refer to the General Specification (GS) sheet of the product for availability. Monel, like the Hastelloy C-276, is a nickel-based metal but, it introduces copper and a small amount of iron, manganese, carbon, and silicone to the mix. Commonly, Hydrofluoric (HF) acid applications use a transmitter with Monel diaphragm material because of its unique corrosive properties. However, the process produces hydrogen ions when the weak bond between the hydrogen and fluoride break. Given the loose latticework of the nickel-based Monel, hydrogen permeation occurs. Gold-plating the Monel is the only solution for this type of application. Free hydrogen ions in a process cause damage to a pressure transmitter over time. By keeping the temperature at the diaphragm as low as possible, the diffusion of those ions into the fill fluid slows. Material selection with a correct additional coating/plating can also slow the rate of permeation. 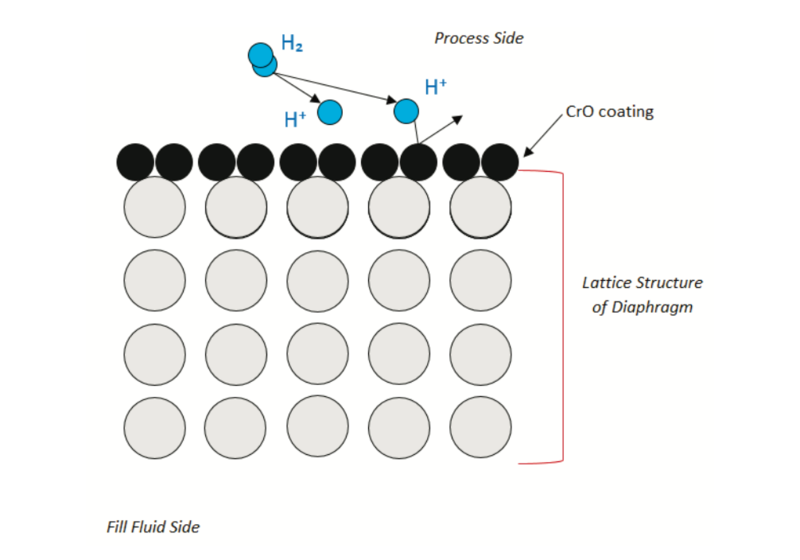 Gold- plating and CrO passivation work to a different degree to prevent Hydrogen permeation. Both are effective against Interstitial mechanisms, and Substitutional (vacancy) mechanisms. The CrO method merely gives the Hastelloy C-276 the same resistance to hydrogen permeation as Stainless Steel. It is the lower cost option and should be is used in a process that has a low occurrence of hydrogen ions. The gold-plated method, although more expensive, is for any process that is known to produce hydrogen ions. In general, if there are any hydrogen ions present in the process, gold plate the diaphragm. In applications with the known high occurrence of hydrogen ions, apply the thicker gold plating. These guidelines are just that - guidelines. Each process is unique, Yokogawa does not make any guarantees that these guidelines work for all processes. The end user’s experience with their process is the best source of information for the engineering of the solution. 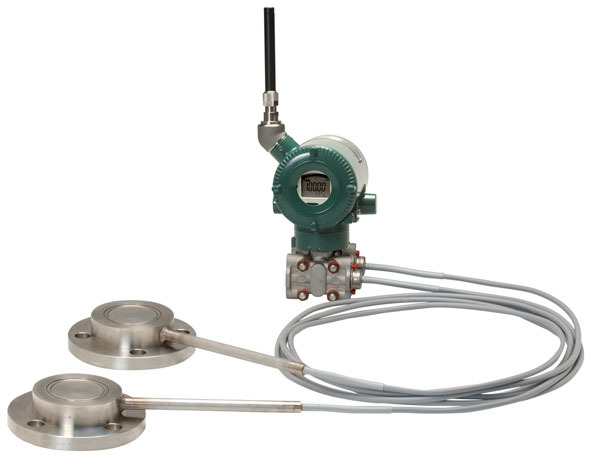 In-Line Mount Gauge Pressure Transmitter based on the EJA-A Series.